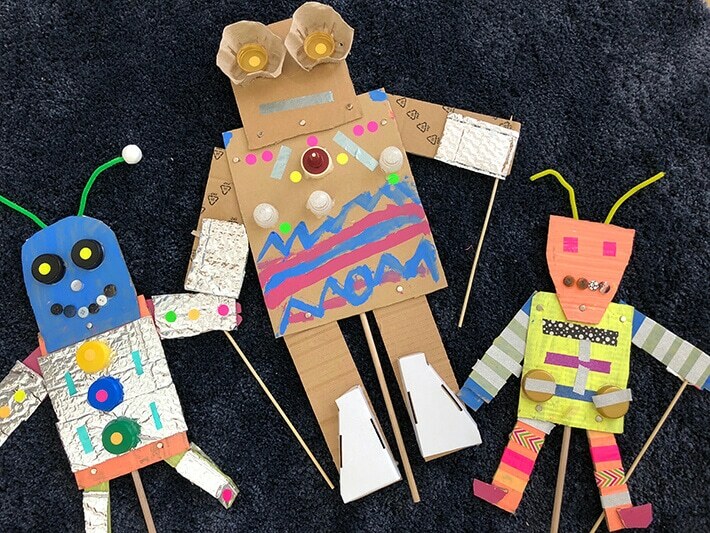 Learn how to create fun robot puppets that actually MOVE using cardboard and other recycled materials in this make and play project for kids by Danielle Falk of Little Ginger Studio. Any art teacher will sing the praises of humble ol’ cardboard as a brilliant material for art-making. A cardboard box has endless possibilities for re-invention as a fort, rocket, shop or whatever. Cardboard can easily be cut, glued, painted, decorated and shaped into almost anything little imaginations can come up with. And it lends itself especially well to puppet-making as it is strong but still easy to manipulate. You’ve heard me rave on about how much children enjoy creating and playing with puppets before, and these robot puppets I’m about to show you are no exception. It’s especially fun to create extra-large robots so that children can hide behind their robot puppets and get really lost in role-playing their characters. This puppet-making activity is mostly made with recycled materials so you can feel good about not purchasing too many materials & being thrifty too! It is suitable for 4 year olds (with some assistance) to 12 year olds. lots of medium weight cardboard (ie: that is still “cuttable” with scissors). Depending on the age of the children you might wish to pre-cut some into “robot shapes”: squares, rectangles, triangles, long limbs etc. a good quality high temp hot glue gun & glue gun sticks (teacher use only). Low temp mini guns won’t be strong enough. RECYCLED MATERIALS! 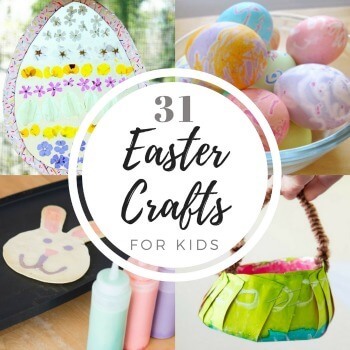 The more the better: bottle tops, champagne bottle cages, jar lids, popsicle sticks, coffee cup holders, cardboard packing materials, cardboard rolls, egg cartons, silver bubble wrap – old nuts & bolts and screws would look amazing too! washi tape, pom poms, pipe cleaners, colored construction paper (for added color) or aluminum foil to add bling! lots of split pins and something sharp to make holes in the cardboard (I used a Phillips head screwdriver). I like these long split pins as they are easier for kids to use. Begin by selecting a large square or rectangle for the body and head shape. A responsible adult will need to attach this with a hot glue gun. Next, choose some limbs and attach the hands and feet in the same way. We took our time arranging & re-arranging our pieces until we thought our robots had enough “personality” (Kookiness? Whimsy?). Kids can decorate their robots using paint, paint sticks, paper, washi tape, silver bubblewrap & foil in any way they like. It’s best to direct them towards using smaller pieces & ensure everything is attached properly (with glue). However in terms of how to decorate their puppets, I take a lot of pleasure in presenting children with a wealth of exciting materials. Then I step right back to watch their creativity in action! I’m always amazed at how innovative kids are. Antennae: pipe cleaners, metals bits etc. These materials will all need to be hot glued on by a responsible adult. Carefully line up the limbs and body and make holes at the ends of each limb (not too close to the edge). Create holes in the right places on the body as well. Line up the holes and attach the limbs by sliding the split pins through both holes and splitting the pin at the back to hold in place. Kids LOVE doing this bit, but will probably need help to press down the pin firmly. Pro tip: Pop some duct tape on top to hold the split pin in place. Once again, that handy responsible adult will have to use the hot glue gun to attach the dowel puppet handle. It’s also a good idea to add duct tape here for extra strength. Pro tip: Be sure the glue dries sufficiently before attempting to use the handle. I also added a wooden skewer (rammed into the edge of a cardboard hand so kids can move one of the arms). It’s playtime! Create some silly robot voices, have fun moving the robot puppets arms and maybe make a funny Robot Puppet Show.